The data obtained from batch experiments were used to train the network. 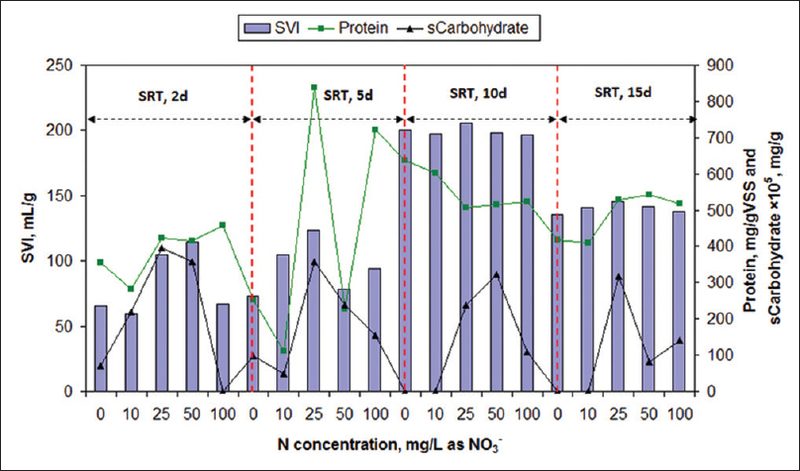 The input layer had three neurons consist of influent COD, SRT, and influent nitrogen. The output layer had one neuron consists of effluent COD concentration (or carbohydrate and protein production). Same approach was adopted to the prediction of carbohydrate and protein production. 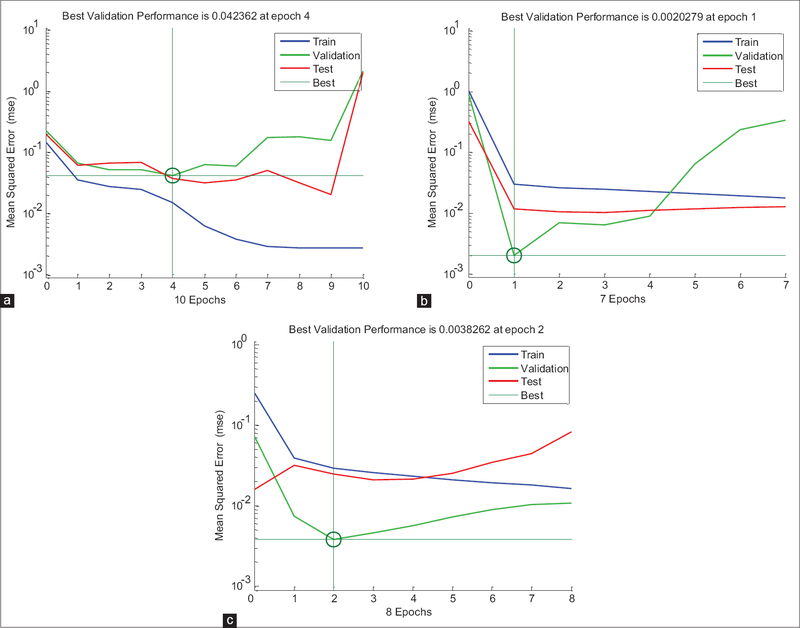 All data were randomly split into three groups (70% for training, 15% for validation, and 15% to test the model). To obtain the optimum number of neurons (N) in the hidden layer, trial and error method was used. Therefore, different number of neurons in the range of 1–10 was tested in the hidden layer. The optimum hidden layer size was determined based on the minimum value of MSE and R2 of the predicted results. 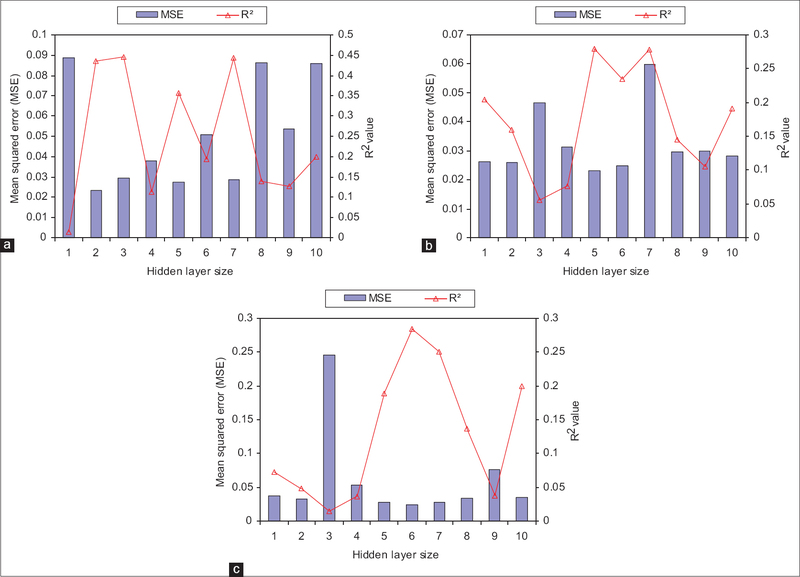 As seen in [Figure 1], as the number of neurons in the hidden layer increase, MSE decreases promptly and then rises. Plot of MSE versus the number of iterations for optimal ANN model [Figure 2] show that the training was stopped after 10, 7, and 8 epochs for effluent COD concentration, carbohydrate, and protein production, respectively. [Figure 3] showed that the training and testing performance of the ANN model. It shows that the ANN model is able to predict the removal of zinc ions from wastewater using activated almond shell with MSE <0.05. With regard to the fact that many factors involve in EPS production and also the level of uncertainty involves, the proposed modeling methodology can be used to data prediction. 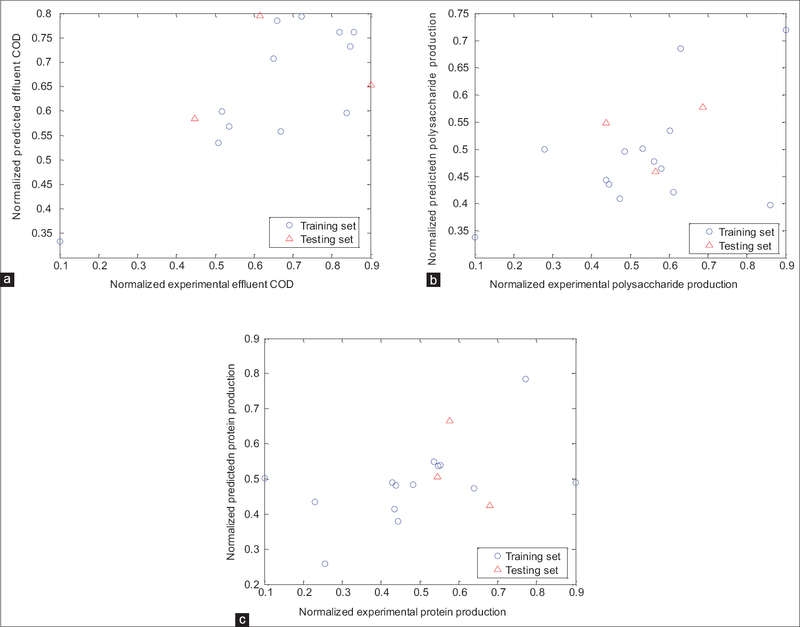 The COD removal efficiency throughout all batch experiments is presented in [Figure 4]a. The results show that with increase of SRT, the COD removal is enhanced. It was expected that the COD removal controlled by two processes including biomass assimilation/accumulation and oxidation, in which these processes were strongly influenced by SRT. The ANOVA test showed that the COD removal efficiency related to 2-day SRT was significantly lower than those at SRT 5, 10, or 15 days (P< 0.05). However, there was no significant difference between COD removal efficiency at other SRTs (5, 10, and 15 days). Furthermore, no significant relationship between COD removal and initial N concentration was observed, and the results demonstrated that by changing of initial N concentration (increasing or decreasing), the COD removal efficiency remains relatively constant. Perhaps, it means that bacteria can uptake carbon as an electron donor in both N deficit and abundance. In these tests, at C/N ratio of 100:0, 100:1, 100:2.5, 100:5, and 100:10, the average of COD removal efficiency was 95.9%, 95.35%, 93.79%, 93.14%, and 94.66%, respectively. The small variation of COD removal at different initial N concentration is in line with Feng et al. They reported that as COD/N ratio decreases from 10 to 5, the average efficiency of COD removal fluctuates from 94.3% to 94.5%, respectively. The sludge settling characteristics can be examined with microscopic observation of sludge or SVI. For this purpose, the variations of SVI during batch experiments were survived. 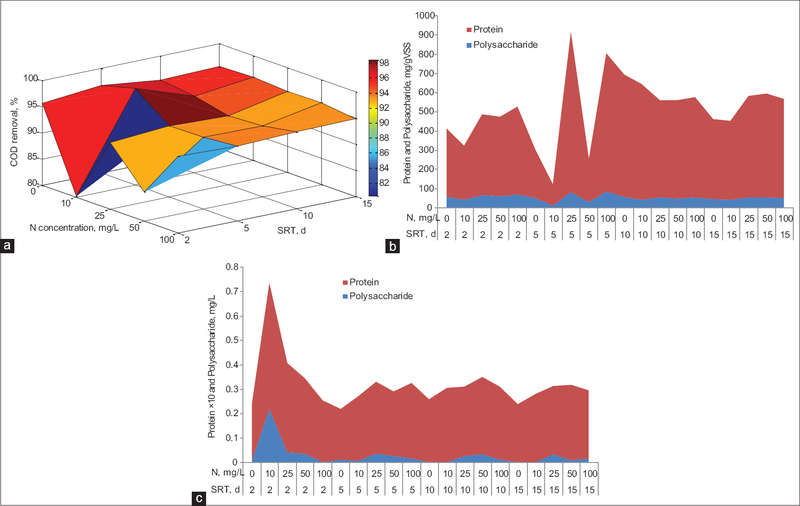 Following the EPS and sEPS variations by initial nitrogen and SRT fluctuations, SVI was varied as shown in [Figure 5]. The amount of protein and protein-to-carbohydrate ratio in EPS has positively affected the value of SVI (Pearson correlation coefficient; 0.478 and 0.509, P < 0.05). The proposed ANN modeling methodology can be used to predict the results. Sheng GP, Yu HQ, Li XY. Extracellular polymeric substances (EPS) of microbial aggregates in biological wastewater treatment systems: A review. Biotechnol Adv 2010;28:882-94. Miqueleto AP, Dolosic CC, Pozzi E, Foresti E, Zaiat M. Influence of carbon sources and C/N ratio on EPS production in anaerobic sequencing batch biofilm reactors for wastewater treatment. Bioresour Technol 2010;101:1324-30. Xuan W, Bin Z, Zhiqiang S, Zhigang Q, Zhaoli C, Min J, et al. The EPS characteristics of sludge in an aerobic granule membrane bioreactor. Bioresour Technol 2010;101:8046-50. Sponza DT. Investigation of extracellular polymer substances (EPS) and physicochemical properties of different activated sludge flocs under steady-state conditions. Enzyme Microb Technol 2003;32:375-85. Ahmed Z, Cho J, Lim BR, Song KG, Ahn KH. Effects of sludge retention time on membrane fouling and microbial community structure in a membrane bioreactor. J Memb Sci 2007;287:211-8. Yang SF, Li XY. Influences of extracellular polymeric substances (EPS) on the characteristics of activated sludge under non-steady-state conditions. Proc Biochem 2009;44:91-6. Linton J, Jones D, Woodard S. Factors that control the rate of exopolysaccharide production by Agrobacterium radiobacter NCIB 11883. J Gen Microbiol 1987;133:2979-87. Wang H, Deng H, Ma L, Ge L. Influence of operating conditions on extracellular polymeric substances and surface properties of sludge flocs. Carbohydr Polym 2013;92:510-5. Liu Y, Liu H, Cui L, Zhang K. The ratio of food-to-microorganism (F/M) on membrane fouling of anaerobic membrane bioreactors treating low-strength wastewater. Desalination 2012;297;97-103. Ye F, Ye Y, Li Y. Effect of C/N ratio on extracellular polymeric substances (EPS) and physicochemical properties of activated sludge flocs. J Hazard Mater 2011;188:37-43. Liao BQ, Allen DG, Droppo IG, Leppard GG, Liss SN. Surface properties of sludge and their role in bioflocculation and settleability. Water Res 2001;35:339-50. Sesay ML, Ozcengiz G, Dilek Sanin F. Enzymatic extraction of activated sludge extracellular polymers and implications on bioflocculation. Water Res 2006;40:1359-66. Taheri E, Khiadani MH, Amin MM, Nikaeen M, Hassanzadeh A. Treatment of saline wastewater by a sequencing batch reactor with emphasis on aerobic granule formation. Bioresour Technol 2012;111;21-6. Rice EW, American Public Health Association, American Water Works Association, Water Environment Federation. Standard Methods for Examination of Water and Wastewater 2012. American Public Health Association; 2012. Adav SS, Lee DJ. Extraction of extracellular polymeric substances from aerobic granule with compact interior structure. J Hazard Mater 2008;154:1120-6. Brummer Y, Cui SW. Understanding carbohydrate analysis. Food Carbohydrates: Chemistry, Physical Properties and Applications. Taylor and Francis: CRC; 2005. Waterborg JH. The lowry method for protein quantification. The Protein Protocols Handbook. New Jersey, USA: Springer; 2009. p. 7-10. Feng S, Zhang N, Liu H, Du X, Liu Y, Lin H. The effect of COD/N ratio on process performance and membrane fouling in a submerged bioreactor. Desalination 2012;285:232-8. Li XY, Yang SF. Influence of loosely bound extracellular polymeric substances (EPS) on the flocculation, sedimentation and dewaterability of activated sludge. Water Res 2007;41:1022-30. Huang Z, Ong SL, Ng HY. Submerged anaerobic membrane bioreactor for low-strength wastewater treatment: Effect of HRT and SRT on treatment performance and membrane fouling. Water Res 2011;45:705-13. Amin MM, Khiadani MH, Fatehizadeh A, Taheri E. Validation of linear and non-linear kinetic modeling of saline wastewater treatment by sequencing batch reactor with adapted and non-adapted consortiums. Desalination 2014;344:228-35. Eckenfelder WW. Industrial Water Pollution Control. University of Michigan, USA: McGraw-Hill; 1989.